Welcome to the Buckeye Regional FIRST Robotics Competition’s new “mobile-friendly” home on the internet. The FIRST Robotics Competition engages high school students in the fun and challenge of building a robot of a specific size, weight (Under 125 pounds) and cost (Under $5,500) in as little as six weeks. The objective of each game is different each year and is revealed at the kickoff. 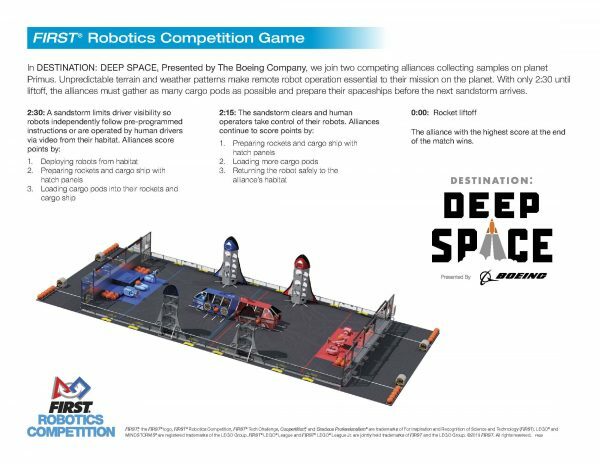 This year, the FIRST robotics competition commemorates the 50th anniversary of the first manned landing on the moon with a space-themed robotics challenge named Destination: Deep Space. Students from schools and organizations collaborate with mentors from government, academia, and industry to design, build and test their robot throughout the six week “build” period. All of this hard work and dedication culminates with the regional competition. The Buckeye Regional competition is one of many competitions occurring in the United States and around the world. Several teams that win the Buckeye Regional competition or other awards will be eligible to attend the FIRST Robotics championship in either Michigan, or Texas. The overall goal of the competition is to engage students in an engineering project to design, build, test, and operate a robot which would encourage them to pursue careers in Science, Technology, Engineering, and mathematics. If you would like to leave feedback on this website or offer suggestions for improvement or new things you’d like to see, email Tim at William.t.dedula@nasa.gov. To pre-order team meals during the Buckeye regional, print and return the Team Meal Order Form – Due by 3/20/19 (pdf). In DESTINATION: DEEP SPACE, Presented by The Boeing Company, we join two competing alliances collecting samples on Planet Primus. Unpredictable terrain and weather patterns make remote robot essential to their mission on the planet. With only 2:30 until liftoff, the alliances must gather as much cargo pods as possible and prepare their spaceships before the next sandstorm arrives. Read below for a full description of the game. Click the image BELOW to enlarge. Links below are related to this season’s game. All links below open in a new tab or window. We currently have 60 teams registered to attend the 2019 Buckeye Regional FIRST Robotics Competition. View or print the team list (pdf). Every year, the Buckeye Regional requires more than 200 volunteers to make the competition run smoothly. We greatly appreciate the time and commitment of all of our dedicated volunteers to support the young people aspiring to become future innovators. Consider becoming a volunteer for the Buckeye Regional FIRST Robotics Competition. Read the Volunteer overview (pdf) to learn more about volunteering and read the VolunteerTask Descriptions (pdf) to learn about the many types of fun jobs we have available. For questions, please contact our Volunteer Coordinator (Email), Jon Potter. 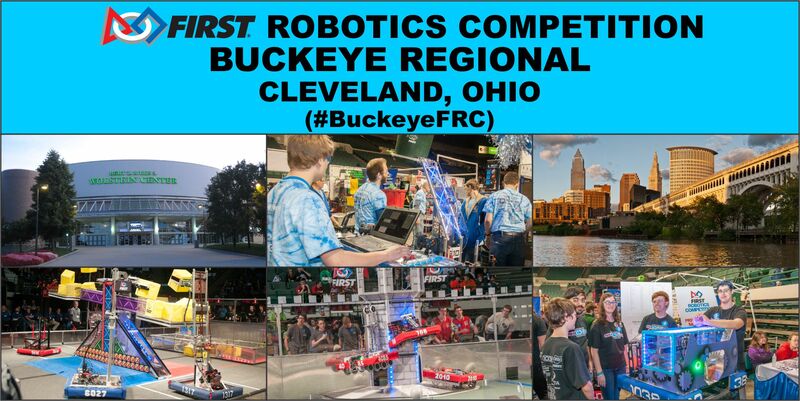 The 18th annual, FIRST (For Inspiration and Recognition of Science and Technology) Robotics Competition Buckeye Regional will be held March 28-March 30 at Cleveland State University’s Wolstein Center located at 2000 Prospect Ave. Practice matches will be held on Thursday, March 28 from noon to 6:30 p.m. Competition days are Friday, March 29 from 9 a.m. to 5:45 p.m. and Saturday, March 30 from 9 a.m. to 4:30 p.m. Admission is free and open to the public. Get directions to the Buckeye Regional Competition at Wolstein Center using Google Maps. View or print the 2019 Buckeye Regional Event Handbook (.pdf) for information on Parking, Load-in, food and so much more. View the competition schedule below or PRINT IT HERE. The Buckeye Regional webcast enables anyone around the world with a computer and internet connection to watch our regional competition. The webcast is also a great way for parents of participating students to follow their son or daughter’s robotics team throughout the competition. If you have any down time during your visit to Cleveland, we have complied a list of activities for you to explore. Click Cleveland-Area activits (pdf) for a list of Cleveland-Area activities. Select a Year below to view a photo gallery. The Buckeye Regional Planning Committee would like extend our sincerest gratitude to our partners and sponsors. Without their generous contributions, the competition would not be possible. Click here for information for potential sponsors (Link), or contact the Buckeye Regional funding team if you want to be a sponsor (Email). View our full list of 2019 Buckeye Regional Partners and Sponsors. Thank them for making the 2019 Buckeye Regional possible. The Buckeye Regional requires a huge team effort by business, academia, and government. If you have a question about any aspect of the competition anytime during the entire season, the personnel below will be able to assist you. View or print a list of the Buckeye Regional Planning Committee members.